The Tibor de Nagy Gallery is pleased to present a selection of early New York cityscapes dating from the late 1930s and early 1940s. The exhibition coincides with the exhibition: Picturing New York: The Art of Yvonne Jacquette and Rudy Burckhardt, currently on view at the Museum of the City of New York. The gallery exhibition will focus on images of New York City, including photographs taken in Queens and Manhattan. In the photographs the artist captured an early New York that may look unfamiliar to a modern day observer. The images from Queens include sparsely populated sidewalks, factory buildings, abandoned cars and neglected lots. Burckhardt was able to capture a quiet community sitting right outside the hustle and bustle of Manhattan. The objects, the landscape, and the skyline provide the compositional structure throughout the images. By using these structures as compositional elements, he created a sense of minimal abstraction where the objects are not to be viewed as documentary, but rather as shapes and forms within a piece of art. Burckhardt used the same approach for the images taken in Manhattan, but instead of automobiles and siding, Burckhardt used figures as his subject matter. He cropped them off at the waist to create an almost abstract image of shapes with positive space competing against negative space. Looking down at the crowd moving through the sidewalk, Burckhardt was able to capture the movement of the city. This collection of images may appear to be contrasting in subject matter, but the consistency lies in Burckhardt unmatched ability to capture a sense of time and place. 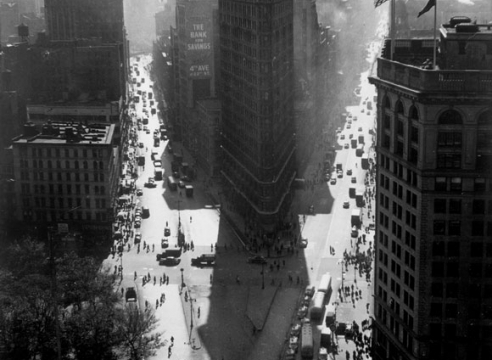 It is believed that these photographs were printed in the 1950s for an exhibition at the Limelight Gallery, New York. 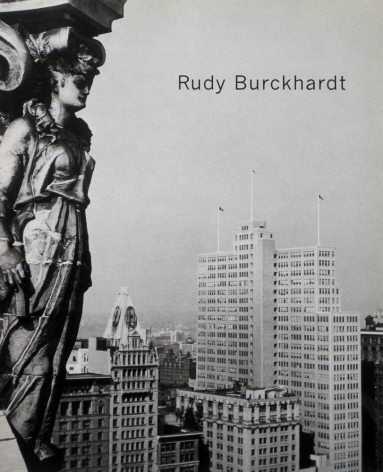 Burckhardt’s work was the subject of the 2005 exhibition: Rudy Burckhardt-New York Moments, Photographs and Films, shown at the Kunstmuseum in Basel, Switzerland. Burckhardt’s photographs also were the subject of a 2002 exhibition at the Museum of Modern Art, An Afternoon in Astoria. A facsimile photo album was published by the Museum on the occasion of the exhibition. His work has been included in a number of museum exhibitions including the Metropolitan Museum of Art’s New York, New York: Photographs from the Collection, and the Centre Pompidou’s exhibition Les Annees Pop 1956-68. A documentary Man in the Woods: The Art of Rudy Burckhardt, directed by Vivien Bittencourt and Vincent Katz (produced by Checkerboard Film Foundation) was released in 2003.